Now nearly a hundred years old, Johann Brandt, the lone surviving member of the original party, shares his discovery with Jordan Brooks, an evolutionary anthropologist who launches his own expedition into one of the most dangerous environments on the face of the planet in search of the evidence Brandt claims to have left behind. 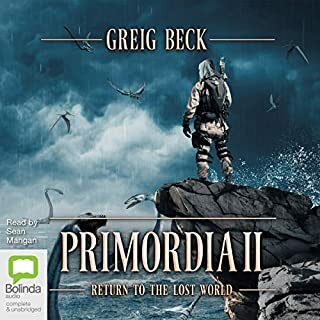 If Brooks and his team hope to find the proof, they'll have to follow the historical footsteps of the Germans into the hunting grounds of a species that evolved in utter geographical isolation, and their only hope for survival lies in uncovering the truth about the ill-fated Nazi expedition...for those who don't learn from the past are doomed to repeat it. There is a great deal to like about this novel. It contains some of the usual techno-thriller ingredients: Nazis, esoteric science, the Yeti, and long, lost Tibet. If you were to judge it by those alone you might well say, "Meh." However, it's how these ingredients are mixed that gives this novel its unique flavor. The plot unfolds in parallel tracks; present day, and via journal entries from the original expedition. 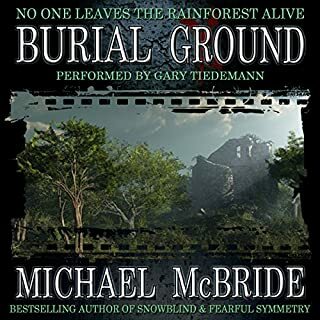 McBride does an outstanding job of interweaving these story lines. It's never cluttered or confusing, in large part because the journal entries are written in period style. The language and word choices harken back to the 1930s, giving the reader a clear delineation between what has happen, and what is happening. The plot and universe remind me of Niven's "Protectors" series. To be sure, this is a techno-thriller and not hard science fiction, but I felt teased by the similarity of the elements. McBride did an enormous amount of research for this novel. The explanations of the sciences embraced and the history used serve to inform and heighten the story's drama and tension. He accomplishes this by distilling complex ideas into readily manageable chunks. The reader surfs on a wave on information and isn't buried under a tsunami of facts. At least, initially. Regrettably, the info dumps do get tedious. At one point I was shouting "Out with it already!" For instance, I didn't need to know the number of tattoos on the priest's face, or their arrangement, or their native name, symbology, or significance. Having all that information didn't move the plot along one bit. Is was a distraction, tying back to nothing, and dragging at the pacing. The outcome of the story felt like it had been pulled out of a top hat. It was an abrupt about face ending. It's possible that it was foreshadowed so cleverly that I just missed it, however I felt like I'd not just been fooled, but suckered. I know it sounds like I'm nitpicking, but that's all I'm really left with. The bulk of the novel is crisp, well written, and fascinating. 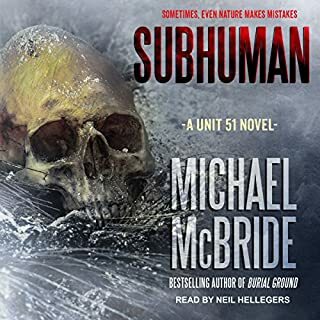 So, despite any of my reservations, if you enjoy a rollicking techno-thriller this is a book you'll want to read or, in particular, listen to. Would you listen to Fearful Symmetry again? Why? Definitely because it's the type of book that you could read again and again and discover new things about it. I loved how much the author put into the story. It's well written and developed and the amount of detail was amazing. Age old secrets collide in this thrilling story. This was such a great listen. I started it and honestly had a hard time putting it down. It had the recipe of a great book anyway, Nazis, Himalayas and an expedition! Well I'm so glad to say that the author more than delivers. The author puts so much into the story and it showed. The amount of detail and the vivid descriptions were amazing. I loved reading the scenes from the forest because it felt like I was there. He described them so perfectly. The characters were all well developed and written. The plot was extremely fast paced and is told from the present and through a journal from the past. It was fascinating seeing the story unfold in both times. In all a tense and thrilling read. I thought it was heading in a certain direction but the author threw in a twist that left me reeling. The whole way through I was on the edge of my seat and couldn't wait to see where it was going. The audio of this was fantastic. The narrator did an amazing job of voicing the different characters. He drew me into the story and made it that much more enjoyable. I'd highly recommend you listen to this!! Good story, good narrator, kinda slow at first but still awesome! 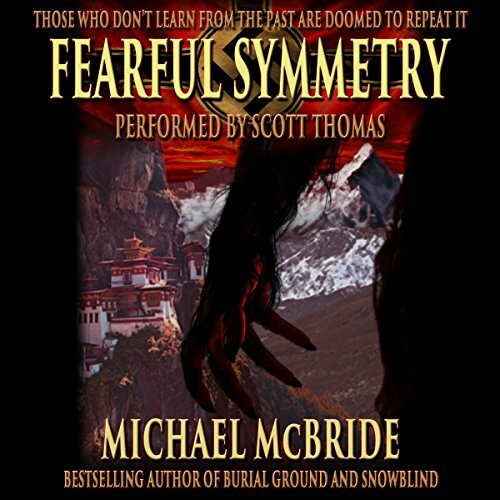 What other book might you compare Fearful Symmetry to and why? Not sure, Burial Ground by the same author, even though it's not the same at all. I could have if I'd have had the time. Fantastic narrator, Thomas does voices and accents very well. This book was really good! 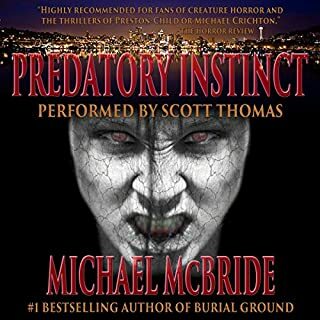 It was on the lines of Michael Crichtons' style of writing.A thriller with suspense,'monsters' and science.What more can you ask for?It was well written.The characters were likable.The narrator,Scott Thomas,was perfect for this book.I was gifted a copy for an honest review.I honestly loved it! 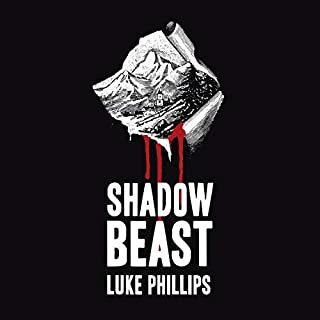 I would recommend to friends who like a thriller/monster story. I think the scenes where the protagonists make stunning realizations while in Nepal. It was a bit long for that. But it would work well as a marathon (I guess a long drive?) listening. Sometimes I felt as if my layman's understanding of evolutionary science and its attendant anthropology left me a bit behind where the author expected. McBride's Fearful Symmetry kept my interest through to the end. While I tend to be a fan of lighter fare, the narrator, Scott Thomas breathed life into the characters and paced the story excellently. I thoroughly enjoyed listening to this audiobook and would happily recommend it. I thought the plot was very good with great twists. This is the first narration I have listened to by Scott Thomas, however I will certainly be looking out for more. Jordan launches his own expedition following in Brandt's historic footprints. With the benefit of modern scientific knowledge and superior tools, he hopes to discover an entirely new species. I don't think my synopsis does this book justice. I enjoyed every minute of this audiobook. It is a non-stop roller coaster ride that will have listeners on the edge of their seats. 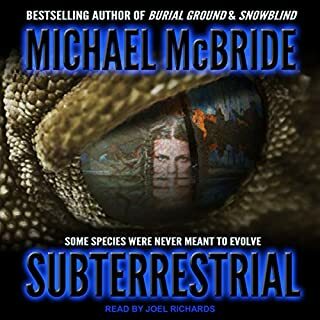 This book was the first novel of Michael McBride's that I have read and I will definitely be looking forward to reading more of his books. Beware of Tibet invading Nazis! What did you like best about Fearful Symmetry? What did you like least? Least...the crappy German Nazi accent grew to be irritating, as did the often overwrought action scenes. It sort of ran out of energy towards the end, and the foreshadowing and twists were convoluted and , in some cases, laughable. What three words best describe Scott Thomas’s voice? Do you think Fearful Symmetry needs a follow-up book? Why or why not? It certainly has sufficent threads open for their to be a follow up, but there is no pressing need. The characters are not so compelling as to require one. This certainly wasn't the worst expenditure of a credit I have ever done, but in no ways the best either. I am ambivalent about recommending this, and ended up giving maybe a higher star than it deserves, mainly because there is the bones of a decent story here. It does lag and could benefit from a solid editor. Barely recommended, with some reservations. It's been a while since I listened to something this gripping. I really could not stop listening, which cost me a few sleepless nights, and not so productive days. I loved the whole setting, Nepal... somewhere... middle of nowhere, a group of people looking for something, get picked off one by one. Nazi conspiracies, monsters, remote setting, what more could you want?! Even the Narrator (American!) did a superb job, adding depth to the characters. The story wasn't as naff as it might sound, the plot was, if not entirely believable, let's say not too far off the mark. And with enough twists and turns to keep you guessing all the way through. And the 'info dumps' mentioned in other reviews I found very interesting, not too overwhelming. I will be chasing down others by this Author for sure.